One of the reasons why a majority of Indians sleep peacefully at night is that they have dedicated police forces committed to ensuring the safety of its citizens. And what these aspiring police officers need to be fit for the job, physically and mentally, is nutritious food and good education. Akshaya Patra’s mid-day meals are nourishing these aspirations of Nikit Kumar, a Std VII student of Government Higher Primary School, Jyothipura, Bengaluru. At lunch time, as the children sit in rows under the leafy canopy of a tree in school premises, their faces are lit with the smile of satisfaction that comes only with a full stomach. Among a group of boys happy to share their thoughts and dreams with the world, is Nikit. His father Ramesh is a driver while his mother Lakmamma, is a homemaker. 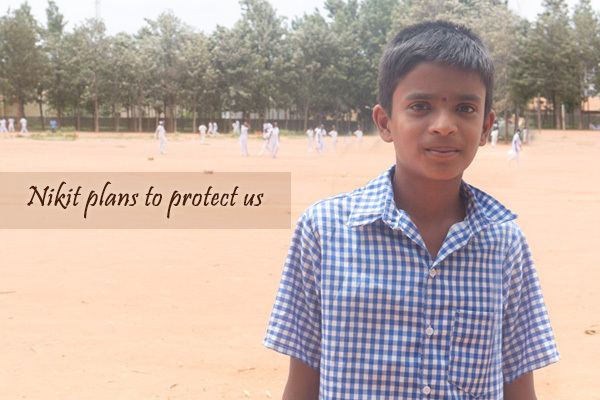 He has two siblings –– Rakshan and Meghana, studying in Std XII and Std VI respectively. Nikit’s father is the sole breadwinner of the house. “I like Akshaya Patra meals. They boost my energy, which in turn powers my concentration in class,” says young Nikit, who is passionate about the uniform and the duties that come with it. He adds, “I will become a loyal officer, who will see to it that law and order are properly maintained. The citizens should be happy. I will ensure the safety of women and the public in general, by catching hold of criminals.” It is evident that the police are a mighty force in Nikit’s eyes and a source of much fascination. He believes that bad people are afraid of them. The young man’s ambition is fascinating and awe-inspiring. The conversation with Nikit and his friends would have continued, but with the ringing of the school bell, classes beckoned them again. They then said their goodbyes and proceeded to their classes.